The article aims to outline a theoretical framework for conceptualising higher education as a common good, as well as to reveal the empirical manifestations of this phenomenon. It argues that the extent to which higher education as a common good is accomplished in a given society/country reflects the accessibility, availability, and affordability of higher education, in addition to the commitment to this goal made by society and all its influential actors. Building on this conceptualisation and using data from various sources for 13 European countries, the authors develop a composite index which measures the extent to which higher education as a common good is implemented in a given country. The results indicate substantial cross-country differences, with Northern Europe scoring most highly. They also demonstrate that higher education as a common good is a complex phenomenon with differences within the country ranks, as well, depending on the varying dimensions considered. Finally, by applying cluster analysis, the article identifies four distinctive clusters of countries with regard to the accomplishment of higher education as a common good, designated as reality, feasible, ambiguous, and problematic. The index developed here can be used to assess the effectiveness of national policies in the sphere of higher education across Europe. The last several decades have been marked by the expansion of higher education as a worldwide trend, one which is expected to continue (Schofer and Meyer 2005). On their path towards mass and universal higher education, the capacity of public systems to fund this sector has decreased, and there is enhanced emphasis on cost sharing in higher education (Johnstone and Marcucci 2007; Orr 2015). At the same time, a huge number of studies have been published which suggest the stable and persistent effect that socio-economic background has on access to higher education. It has also been revealed in many countries that the level of qualitative socio-economic inequalities in higher education is on the rise (Blossfeld and Shavit 1993; Raftery and Hout 1993; Lucas 2001; Pfeffer 2008; Ilieva-Trichkova and Boyadjieva 2014). The essence of recent trends and studies in higher education can be summarised using Marginson’s (2016) words in the following way: although “there is a worldwide tendency to high-participation systems” and higher education “is becoming more socially inclusive at a rapid rate and on a worldwide scale”, the “[e]quality of opportunity in the full sense is unrealisable, because of the persistence of irreducible differences between families in economic, social and cultural resources” (p. 69). Taking into account these tendencies, the renewed European agenda for higher education sets the goal of “building inclusive and connected higher education systems” for the purpose of “ensuring that higher education is inclusive, open to talent from all backgrounds, and that higher education institutions are not ivory towers, but civic-minded learning communities connected to their communities” (European Commission 2017, p. 6). As some authors acknowledge, “[c]ompared to earlier modernization agenda documents, this new policy offers a more balanced approach to strengthening higher education’s contribution to society, including not only economic development but also social inclusion and social progress” (Klemenčič 2018, p. 2). However, the specificity of the higher education system of a given country depends not only on whether it sets the goal to develop as an inclusive one and to promote equality of opportunities but also on how this goal is achieved—whether it is regarded as a responsibility of public bodies and higher education institutions themselves or whether it is considered as an engagement of the broader society. When widening participation in higher education on the basis of the principle of equality of educational opportunities is viewed as a commitment of the whole society and its main stakeholders, this goal transforms from a purely educational to a societal one. Thus, higher education becomes an indispensable ingredient of social equity and could be regarded as a common good. Against this background, the article aims to address the following main research question: What are the empirical manifestations of higher education as a common good? In order to answer this question, we will (1) outline a theoretical framework for conceptualising higher education as a common good, (2) develop an index for measuring the extent to which higher education has been realised as a common good in a given country, and (3) reveal whether countries fall into distinct clusters with regard to the extent of higher education being practised as a common good. Having in mind the novelty of attempting to conceptualise and measure higher education as a common good, and the complexity of higher education itself, the present article presents an exploratory study. The article proceeds as follows. First, the authors discuss the relevant literature and present their own conceptual considerations. This is followed by a description of the methodology used. Then, the empirical results are presented. After that, these results are discussed in the context of previous research, with some directions for future research and policy implications being outlined in the conclusion. “Common goods”, “public goods”, and “the common good” are concepts widely discussed in philosophy, political science, and economics. They have recently attracted the attention of scholars in sociology and educational science, as well. The philosophical tradition of studying the common good dates back to Plato and Aristotle and was further developed in the works of numerous philosophers and political theorists, including Thomas Aquinas, John Locke, Adam Smith, John Stuart Mill, Jacques Maritain, and John Rawls. Although there are significant differences in how the common good is conceptualised within various philosophical and political doctrines, it is generally viewed as a norm which unifies a given (political) community and which is also closely related to “public goods” and “the public interest” (Pusser 2006; Etzioni 2015; Hazelkorn and Gibson 2017). The discussion about common goods received new impetus through the notion of the commons, which has, in turn, gained importance as a result of the ecological challenges stemming from the growth of industry, cities, and populations. The commons’ paradigm “emerged from the crisis of the State and modernism as pillars of development” and “proposed making communities the main players in their own development” (Locher 2016, p. 327). “The tragedy of the commons” has brought to the fore the question of how best to govern natural resources used collectively by many individuals, and has inspired the idea of community governance over resources as an effective vector for development—one that could counterbalance or even replace state intervention and privatisation (Ostrom 1990; Locher 2016). In a recent paper, Szadkowski (2017) applies a Marxist approach to the commons perspective in higher education research and argues in favour of the university of the common as a form of post-capitalist university. The idea of common goods derives from the basic need of all human beings for mutual assistance. In Adam Smith’s (2004, p. 100) words, “[a]ll the members of human society stand in need of each other’s assistance, and are likewise exposed to mutual injuries…”. Recently, Marginson (2016, p. 29) has also argued that “the notion of the common good is a denial that society is and should be composed of atomized individuals living in isolation from one another”. The experience of totalitarian societies shows that tension exists between personal dignity and the practical demands of common goods. It is well known that, in the name of the common good, totalitarian societies subordinate the individual to the state. At the same time, as a rule, capitalist societies emphasise the autonomy of the individual against the demands of the state. As Yuengert (2001, p. 4) argues, “in this case the common good is a necessary antidote to the centrifugal forces set in motion by radical individualism”. Following Maritain (1985), it is worth asserting that society exists for the person and the person exists for society in a way that maintains the dignity of free persons. From such a perspective, the common good must be good for everyone and cannot involve trade-offs where one person’s good is sacrificed for that of another (ibid.). They are “not simply a means for attaining the private good of individuals” (Hollenbach 2002, pp. 81–82) but have their own value. That is why, from a “common good” perspective, it is not only the “good life” of individuals that matters but also “the goodness of the life that humans mutually share in common” (Deneulin and Townsend 2007, p. 24). The “shared action is intrinsic, as well as instrumental, to the good itself, and its benefits come in the course of that shared action” (Deneulin and Townsend 2007, p. 25). According to Maritain (1985), the common good is constituted by goods that humans by nature share in common and communicate to one another, such as values, civil virtues, and a sense of justice. The focus on shared actions is a key characteristic of common goods in comparison not only to private goods but to public ones, too. The whole discourse on common goods refers to what is shared and beneficial for all, or most, members of a given community, or what could be produced by collective actions and active participation in the public and political sphere; thus, common goods include both goods that serve no particular group and those that will serve members of future generations. While “within a public good approach the point of view remains essentially focused on public institutions that should provide the regulatory framework for the development of democratic educational systems, considering education as a common good implies that education is a collective shared endeavour, both in its production and in its benefits” (Locatelli 2016, p. 158). It is also important to stress that common goods are associated with and require the active role of those who benefit from them, while it is possible for the recipients of public goods to remain passive (Locatelli 2018a). Different societies/communities may have different understandings of the common good/common goods. That is why common goods can only be defined within their diverse contexts and conceptions of well-being and common life (Deneulin and Townsend 2007; UNESCO 2015). A specific approach to conceptualising private goods, public goods, and common goods is provided by neo-classical economics. Based on two criteria—excludability and rivalry—neo-classical economists distinguish three types of goods: private, public, and common. Unlike private goods, public goods are non-excludable and non-rivalrous, i.e. individuals cannot be excluded from the use and benefits of these particular goods, and their use by one individual does not reduce their availability to others. A good is non-rivalrous if one person’s consumption of the good does not reduce the benefits someone else obtains from its consumption (Samuelson 1954; Cowen 2007; Deneulin and Townsend 2007). According to Marginson (2016), a common good is non-excludable but rivalrous. Following Deneulin and Townsend’s idea (Deneulin and Townsend 2007, p. 31) and its interpretation by Locatelli (2018a), we accept that public goods possess non-excludable and non-rivalrous characteristics presented in terms of consumption of a commodity, whereas common goods are characterised with non-excludable and non-rivalrous characteristics presented in terms of participation and generation of the goods themselves. Taking into account the above theoretical considerations, our discussion of higher education as a common good will be guided by and organised according to two important perspectives. First, as shown above, the philosophical tradition in the study of the common good refers to both “the common good” and “a common good” or “common goods”. In the following analysis, we will try to ascertain whether higher education could be regarded as a common good. Second, we differentiate between two perspectives that, although closely connected, delineate two distinct relations between higher education and the three types of goods (private, public, and common). The first perspective explores whether, and to what extent, higher education itself is implemented or can be defined as a private, public, or common good. The second one tries to reveal what kind of private, public, and common goods are produced by higher education.3 In this article, we adhere mainly to the first analytical approach. The discussion of possibilities for understanding higher education as a common good outlines new and fruitful perspectives for rethinking and reimagining the essence of higher education and its role in contemporary societies. At first glance, it seems that higher education is mainly a private good and cannot be viewed as a common good. Taking into account Marginson’s (2007, 2011) discussion on higher education, we accept that higher education is intrinsically neither a private nor a public—nor common—good. It is potentially rivalrous or non-rivalrous and potentially excludable or non-excludable, which means that, being nested into wider social and cultural settings, higher education as a good is policy sensitive and, consequently, varies by time and place. Defining higher education as a common good implies acknowledging that it is indispensable for human well-being in contemporary societies. If we accept Amartya Sen’s definition of human well-being as the freedoms that people have reason to choose and value (Sen 1999) or Martha Nussbaum’s list of central human capabilities (Nussbaum 2011), it is beyond doubt that human well-being in modern dynamic and liquid societies (Bauman 2000) would not be possible without the development of higher education as a common good. Higher education as a common good presupposes and requires that it develops as an inclusive process shared by and beneficial to all or most members of a given community/society. Viewing higher education as a common good means that it unfolds in mutual social relationships, in and through which human beings enhance their well-being; it is therefore a kind of collective endeavour in which different and diverse social institutions are involved. Higher education is a common good in and for a given community/society provided it “is immanent within the relationships that bring this community or society into being” (Hollenbach 2002, p. 9). However, it is well known that higher education is a complex phenomenon. Already in 1963, Kerr (1963, pp. 8–9) ascertained that “[t]he university is so many things to so many people that it must, of necessity, be partially at war with itself”. Gradually, it became evident that higher education in contemporary societies performs simultaneously three purposes or activities—teaching (education), research and service (Tight et al. 2009). Further, we can differentiate between the principles, nature, governance, and value of higher education. Given the complexity of higher education, its conceptualisation and functioning as a common good have different manifestations with regard to its different aspects (Locatelli 2018a). In the present paper, we focus on the extent to which higher education in a given country functions as a common good through the principles in accordance with which access to higher education is organised and the values which it promotes and affirms. 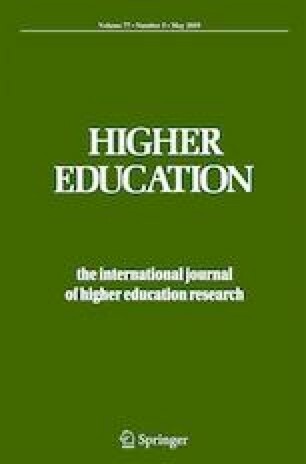 A recent paper (Boyadjieva and Ilieva-Trichkova 2016) develops a model of missions/roles of higher education which is based on bridging the capability approach and the institutional perspective and taking into account both the level of influence (individual or societal) and the character of influence (intrinsic, instrumental, and transformative/empowering) of higher education. The model clearly demonstrates the complex nature and plurality of roles/missions and values of higher education as an institution. Thus, at societal level, in addition to the widely discussed role of higher education for economic and cultural development, the model identifies its role for societal legitimisation of different types of knowledge and values, such as equity, freedom of thought, tolerance, and diversity. One of them equity has become a constituent part of the European Higher Education Area through the social dimension in higher education which has been firmly emphasised within the Bologna Process since 2003 (Berlin Communiqué). Equity is an indispensable dimension of the widening of access to higher education: inequalities in access to higher education, especially those due to socio-economic factors, are important characteristics of higher education systems and how they fulfil their missions. In addition, despite their differences, the philosophical and neo-classical economic perspectives towards common good share an emphasis on the inclusive/shared character of common goods, manifested in both their production and use. Whether and to what extent a given higher education system possesses an inclusive/shared character is reflected in who participates in higher education and who is engaged and involved in its provision. Based on this understanding, higher education can be defined as a common good as far as there is a social commitment (from all providers of higher education—public, private, and non-profit) for organising access in accordance with the principle of social equity. Thus, higher education as a common good is closely related to concepts such as justice, rights (Walker and Boni 2013), solidarity, and equality (Marginson 2016). More concretely, we argue that the extent to which higher education is accomplished as a common good in a given society/country reflects its accessibility, availability, and affordability and the commitment of society and all its influential actors to this goal. Higher education is a common good when it is accessible to a growing number of people and when policies have been implemented to reduce inequalities in and barriers to its access. This line of reasoning allows us to go beyond the theoretical conceptualisation of higher education as a common good and develop an index for measuring the extent to which higher education has been realised as a common good in a given country. The realisation of higher education as a common good differs in different countries and depends on the country’s specific institutional arrangements and the established system of higher education. The empirical basis of our study is made up of country level data drawn from various sources: EUROSTUDENT Surveys V (2012–2015) and VI (2016–2018), official statistics from Eurostat and UNESCO, and European Commission/EACEA/Eurydice’s reports. These data allow us to adopt a wide comparative perspective since they were collected in many European countries. In the present article, we include only countries for which we had data for all indicators and for the latest year possible. Thus, we limit the analysis to 13 countries: Croatia, the Czech Republic, Estonia, Finland, France, Lithuania, Malta, the Netherlands, Norway, Poland, Slovakia, Slovenia, and Sweden. We introduce an index to capture the extent to which higher education has been realised as a common good in a given country. The index includes 14 indicators spread across four conceptual dimensions: accessibility, availability, and affordability of and social commitment to higher education. Accessibility of higher education refers to the ability of people from all backgrounds to access and benefit from higher education on a reasonably equal basis (Usher and Medow 2010, p. 1). It is measured through indicators such as graduates aged 30–34, educational equity index (EEI), gross enrolment ratio (GER) and graduates aged 20–29 in tertiary education per 1000 of the population. Availability of higher education relates to resources (both institutional and individual) which are suitable for higher education and enable people’s participation in it. It is captured by means of the indicators: recognition and part-time students. Affordability of higher education captures the cost of higher education in relation to the financial means and support students receive. It is measured with indicators which refer to annual expenditure, percentage of GDP spent on tertiary education and financial difficulties. Social commitment to higher education refers to the engagement of various actors (public, private, institutions of civil society, religious organisations) in the provision and funding of higher education. It is measured with sufficient support for impairment, support for enrolment abroad, dependence on public support, impaired students supported very well and support to students as a % of public expenditure on tertiary education. Table 1 reports the name and includes description of the source and the time it refers to for each indicator used to measure a given dimension of higher education as a common good. Some of our indicators are based on objective data—others are subjective. We believe that both types of indicators should be taken into account when assessing whether or not higher education is being realised as a common good in a given country. For the index calculation, we have followed the methodology used in the report “Don’t Panic: Findings of the European Catch-Up Index 2015” (Lessenski 2016), prepared by the Open Society Institute - Sofia. This methodology was chosen for two main reasons. First, it offers very clear guidelines for all statistical procedures. Second, it allows for the exploration of the indices’ dynamics over time as a next step in the analysis. More specifically, we have standardised the values of the different indicators described above according to a statistical procedure which recalculates them along a uniform scale, while simultaneously preserving the order and proportions between them. This standardisation was done following the normalisation method of z-scores, which uses mean weighted score and standard deviation. Using this procedure, the distribution of country values for each of the indicators was translated and the mean (0) and dispersion (1) were calculated; the order and proportions between the values for the different countries were preserved. Then, we transformed all the standardised values into scores ranging from 0 to 100. Values smaller than 0 and bigger than 100 (“extreme values”) received scores of 0 and 100, respectively. Each of the four dimensions—accessibility, availability, affordability, and social commitment—contains different numbers of basic indicators. We assigned equal importance to the four dimensions (25% of each). The level of importance of each indicator within a given dimension was calculated by dividing the overall weight of the dimension by the number of indicators. The weights we used are also provided in Table 1. For the sake of transparency, we are prepared to send the indicators themselves on request so that users can use weights other than those proposed in this article. After weighting the components, we constructed the composite index of higher education as a common good comprising all four categories; we then calculated it for the 13 countries. These were the countries for which we found proxy information regarding the indicators of interest. Each of the four basic dimensions has equal importance within the composite index of higher education as a common good. The index ranges between 0 and 100, where a value of 0 means that higher education is not at all realised as a common good in a given country and a value of 100 means that higher education is realised as a common good in a given country to the greatest extent possible. The same interpretation refers to all four dimensions: accessibility, availability, and affordability of higher education and social commitment to higher education. After calculating the overall index scores and the scores for each dimension, we applied a cluster analysis. In general, this type of analysis consists of a collection of algorithms used to classify objects, such as countries, species, and individuals, in order to reduce the dimensionality of a data set by exploiting the similarities/dissimilarities between cases (OECD 2008). In this case, the cluster analysis was made with regard to the categories comprising the overall score of the index of higher education as a common good. More specifically, an agglomerative hierarchical cluster analysis of Ward’s linkage with the help of Stata 14 software was used to discover the number of country clusters. In Ward’s method, the fusion of clusters is based on the size of an error sum-of-squares criterion. The objective at each stage is to minimise the increase in the total within-cluster error sum of squares (see Everitt et al. 2011). However, we should also keep in mind that cluster solutions are sensitive to the specific clustering algorithm used (Kantardzic 2011; Xu and Wunsch 2009). Table 2 shows the overall index scores and the respective country rank for higher education as a common good. The countries are sorted according to their overall index scores. Table 2 highlights the significant differences between countries in terms of the extent to which higher education as a common good has been accomplished, with the Northern European countries scoring the highest and Malta scoring the lowest. Specifically, the country with the highest overall index score is Finland, followed by Sweden, Norway, and the Netherlands: this means that higher education as a common good has been realised to the greatest extent in these countries. However, it seems that in none of the countries studied has higher education as a common good been put into practice completely so far. Countries at the bottom of the table—Slovakia, Slovenia, and Malta—have a long way to go before higher education becomes a common good for most citizens. It is important to emphasise that in calculating the index, we have assigned equal weight to all four dimensions distinguished for higher education as a common good. However, depending on theoretical considerations or policy purposes, researchers or policy makers may prefer to use different weights. In order to facilitate further usability and transparency of the index, we present the indices for each of the dimensions of higher education as a common good in Table 3. Table 3 demonstrates that differences also occur within the country ranks across the four dimensions of higher education as a common good. Sweden, for example, though it places second in terms of its overall score, ranks eighth in accessibility, second in availability, first in affordability, and fourth in social commitment. These differences indicate that higher education as a common good is a complex phenomenon and that, in this respect, problematic aspects which need to be improved upon exist in all countries. In order to deepen our analysis, as a next step, we carried out a cluster analysis of the four dimensions of the common good, thereby trying to capture similarities and differences among countries in the way these dimensions interact in each country. The algorithm we used enabled us to identify four distinctive groups of countries, based on their scores across all dimensions. In Table 4, we have arranged these clusters in order to show the extent to which they represent different levels of realisation of higher education as a common good. We have designated the four distinctive clusters as (1) reality, (2) feasible, (3) ambiguous, and (4) problematic. The reality cluster of higher education is formed by Finland, the Netherlands, Norway, and Sweden. The second cluster of countries, in which higher education as a common good is feasible, includes Lithuania and Poland. The countries where higher education as a common good is ambiguous are Estonia, France, and Slovenia. The final cluster of countries in which the realisation of higher education as a common good is problematic includes Croatia, the Czech Republic, Malta, and Slovakia. Our analysis reveals important empirical manifestations of higher education as a common good. The results presented above suggest that there are four distinct clusters of countries in Europe with regard to the extent that higher education has been realised as a common good. There are only a few classifications of higher education systems in the literature which capture how, in different countries, higher education performs specific functions or serves concrete principles and values. Triventi (2014) suggests a multidimensional empirical classification of higher education systems on the basis of several institutional characteristics likely to affect student participation and social inequality (tracking, expenditures, structural differentiation, institutional autonomy and accountability, affordability for students, graduates’ occupational returns). That study analyses the institutional profiles of higher education systems of 16 OECD countries and groups them into the following regimes: the continental regime, constituted by France, Belgium, Italy, Austria, Germany, the Netherland, and Ireland; the Nordic regime, formed by Finland, Sweden, and Norway; the Anglo-Saxon regime, which includes the UK, Australia, and New Zealand; and the North American regime, comprised of Japan, Canada, and the USA. It is obvious that Triventi’s classification differs from ours because they are based on different indicators and include different countries. Nevertheless, in both classifications, the Nordic countries stand out as being characterised by high levels of participation in higher education, lower social inequality, and strong public engagement in the funding of higher education. Saar et al. (2013) present a classification of adult learning systems and link it to varieties of capitalism approach. However, neither the position nor any characteristics of higher education are clearly discussed in this classification. We see several directions for future research within two broad perspectives. The first is related to further deepening the conceptualisation of higher education as a common good. We agree with Locatelli (2016, p. 153) that the apparent vagueness of the definition of concepts such as common goods, “which may be seen as a limit, constitutes in reality their strength”, and that “common goods exemplify what Lévi-Strauss called ‘significant flottant’, the meaning of which, although imprecise, enables a concept to function as a point of attraction of different meanings”. In order to grasp these different meanings, however, there is a need for important topics to be comprehensively addressed at the theoretical level, for example public interests and higher education as a common good, the public-private divide in the provision of higher education and higher education as a common good, and higher education as a common good and governance in higher education. It is also worth analysing how higher education itself contributes to achieving other common goods. For instance, Walker and McLean (2013) focus on how university-based professional education in South Africa might contribute to the public good of poverty reduction and, thus, to achieving more justice and less inequality. So far, the contribution of higher education to the common goods has not been explored. The second perspective points to different directions for developing a methodology with which to explore the dynamics of how higher education unfolds as a common good in specific national contexts over time. It should be emphasised that higher education is a very dynamic phenomenon. In each country, different transformations have been taking place constantly, both within society and in the arrangement of higher education institutions; these changes influence the way higher education is implemented as a common good. That is why any measurement of higher education as a common good should be clearly contextualised in concrete space and time. The set of indicators used to measure higher education as a common good deserves enrichment in several directions. There is a need to include both subjective and objective indicators and indicators capturing its qualitative aspects. It is additionally important to widen the range of countries studied. A real challenge is conceptualising and finding reliable indicators for measuring how higher education is being implemented as a common good in relation to its different institutional aspects, e.g. its governance. If we accept that a common good perspective to higher education governance means “shared governance justified on the basis of the cultural and social value of a specific good” (Locatelli 2018a), at least two important questions emerge: (1) Shared with whom? and (2) How shared governance of a given higher education institution/system intervenes with its institutional autonomy? The “lessons” from the introduction of the New Public Management-based higher education reforms should also be taken into account. Some studies show that due to these reforms which call for strengthening the role of managers and external stakeholders in university governance, academics have lost their status as key actors in collegial university governance to a high extent. In response, academics in Europe started creating action platforms against the reform initiatives in order to reclaim their position as influential actors within the higher education governance systems (Leisyte and Bengü Hosch-Dayican 2017). A fruitful direction for future study would refer to factors at the macro as well as micro level, helping to explain differences between countries in the extent to which higher education is realised as a common good. At the macro level, for example, it is worth investigating how different types of welfare regimes, social cohesion regimes, or types of capitalism influence the understanding and implementation of higher education as a common good. Following along Hega and Hokenmaier’s (2002) line of inquiry, Pechar and Andres (2011) try to further explore the relationships between welfare regimes, the extent of higher education’s expansion, and any related trade-offs. Based on Esping and Andersen’s original model, their analysis demonstrates a relationship between conservative, socio-democratic, and liberal welfare regimes and patterns of education policy. When investigating higher education as a common good, this typology is worth extending by adding the two regimes suggested by Mills and Blossfeld (2003)—the family-oriented regime of Southern European countries (e.g. Italy and Spain) and the post-socialist welfare regime. Bohle and Greskovits (2012) distinguish three types of capitalism in post-socialist countries: neo-liberal, embedded neo-liberalism, and neo-corporatist. It could be argued that post-socialist countries adhere not only to different types of capitalism but also to different welfare regimes, something that is reflected in the way higher education is being implemented as a common good in those countries. Our findings clearly suggest that countries with socio-democratic regimes provide the most favourable conditions for the accomplishment of higher education as a common good. They also confirm that the post-socialist countries are rather heterogeneous with respect to the social commitment to equitable access to higher education and its realisation as a common good. Our analysis does not take into account the stratified nature of contemporary higher education systems. Still, this could be viewed as the basis for a very important line of future research. According to Marginson (2016, p. 77), too many countries’ higher education systems “are so stratified as to reduce sharply –sometimes empty out – the value of participation for the majority of students”. Marginson (2018) also claims that the common good idea provides a better normative basis than public good for tackling stratification as it allows many actors to contribute to higher education. In this regard, it is important to point to the study of Jerrim et al. (2005). Its findings show that socio-economic status differences in access to high-status private colleges are greater than those for public colleges and that—contrary to the authors’ expectations—socio-economic inequality in high-status college access is remarkably similar across the studied countries (Australia, England, and the USA). According to the authors, this “little cross-national variation, despite substantial differences across these three countries in how higher education is designed, suggests that high socio-economic status families will do whatever it takes to seek out qualitative advantages within the system that they face” (Jerrim et al. 2005, p. 30). That is why further research should pay special attention to the quality aspect of higher education and see how the implementation of higher education as a common good differs as it relates to different higher education institutions and programmes (differentiated by the type of degree—bachelor’s, master’s, or PhD—and field of study) but also in relation to the other two purposes of higher education: research and public service. The present article contains both theoretical and methodological contributions. On a theoretical level, it contributes to further conceptualising higher education as a common good. Evident signs of dismantling the welfare state model and privatisation’s accelerated processes in the sphere of education bring to the fore the need to rethink the nature of all forms of education. A common-good perspective provides grounds for a humanistic approach to higher education, centred around the issues of accessibility and inclusion, and also promotes the values of solidarity and justice in the educational sphere and its governance. More specifically, our analysis demonstrates that the extent to which higher education as a common good is accomplished in a given society/country reflects the accessibility, availability, and affordability of as well as social commitment to higher education. On a methodological level, the article develops an index for measuring the extent to which higher education as a common good has been realised in different countries. The article also has clear political implications as it provides theoretical conceptualisations and develops a methodological instrument—an index of higher education as a common good—for assessing the effectiveness of national polices in the sphere of higher education across Europe. Both the renewed EU agenda for higher education and the new global Education 2030 agenda are committed to promoting equitable, affordable, and increased access to quality higher education (European Commission 2017; UNESCO et al. 2015). This commitment can produce visible results only if higher education is understood, governed, and practised from a humanistic perspective that takes into account both individual and public interests, while also calling for the pursuit of common goods. For a discussion on similarities and differences between the public good and the common good, see also Deneulin and Townsend 2007, p. 32. In our discussion of common goods, we refer to contemporary societies which, to varying degrees, adhere to the principles of democracy and market economy. See, for example, Marginson’s (2016) discussion on the public goods that higher education produces and how it can contribute to the common good, and also Hazelkorn and Gibson’s (2017) discussion of how higher education serves the public good. We would like to thank the two anonymous reviewers for their valuable comments on an earlier version of this article. This research was undertaken within the Programme for support of young researchers and doctoral students in Bulgarian Academy of Sciences – 2017 under grant agreement 17-173/03.08.2017 and within the ENLIVEN project which received funding from the European Union (EU), Horizon 2020 research and innovation programme under grant agreement No. 693989. Cowen, T. (2007). Public goods. In Concise encyclopedia of economics. http://econlib.org/library/Enc/PublicGoodsandExternalities.html. Accessed 5 February 2018. European Commission (2016). Education and training monitor 2016. http://ec.europa.eu/education/sites/education/files/monitor2016_en.pdf. Accessed 5 February 2018. Klemenčič, M. (Ed.) (2018). Higher education in Europe in 2017 and open questions for 2018. European Journal of Higher Education, 8(1), 1–4. DOI: https://doi.org/10.1080/21568235.2018.1425192, published online 29 Jan 2018. Locatelli, R. (2018a). Higher education as a public and common good. Lecture delivered at the Centre for Global Higher Education UCL Institute of Education, London, 8th February. http://www.researchcghe.org/perch/resources/higher-education-as-a-public-and-common-good-rl-08-feb.-seminar.pdf. Accessed 15 February 2018. Marginson, S. (2018). Higher education as a common good. IIEP strategic debate, UNESCO, 12 March. https://box.iiep.unesco.org/index.php/s/NmASF4Y5LbbM2kA#pdfviewer. Accessed 15 March 2018. UNESCO, UNDP, UNFPA, UNHCR, UNICEF, UN WOMEN, … ILO (2015). Education 2030—Incheon declaration and framework for action for the implementation of sustainable development goal 4. http://unesdoc.unesco.org/images/0024/002456/245656e.pdf. Accessed 15 March 2018. Usher, A. (2004). A new measuring stick. Is access to higher education in Canada equitable? Educational Policy Institute. http://www.educationalpolicy.org/pdf/measuringstick.pdf. Accessed 05 February 2018. Usher, A., & Medow, J. (2010). Global higher education rankings 2010: affordability and accessibility in comparative perspective. http://www.ireg-observatory.org/pdf/HESA_Global_Higher_EducationRankings2010.pdf. Accessed 05 February 2018.